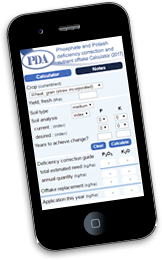 Buying and applying fertiliser has a cost to the farmer – a financial cost that has increased greatly recently for nitrogen (N), phosphate (P) and potash (K) fertilisers. In turn, these increases have raised questions about ‘the response’ to applying phosphate and potash fertilisers in particular because frequently there is no visual response to their application. But the question about ‘response’ misses the point, based on our improved understanding of the behaviour of phosphate and potash in soil. Currently the aim is to maintain soils at a ‘Target Index’ of both these nutrients to ensure achieving optimum yields. The question then becomes ‘how much yield will be lost if plant-available P and K in soils falls below the target Index’. There is evidence that other inputs required to achieve good yields of crops, especially nitrogen, are used less efficiently when soils contain less phosphate and potash than those at the target Index. In the case of nitrogen one key requirement is to ensure that the soil contains adequate amounts of plant-available potash because there is a strong interaction between these two nutrients in crop growth. This interaction is the topic of this booklet. It is equally important that soil physical conditions are satisfactory, especially soil structure and water content, to avoid limitations to root growth and the ability of roots to take up the nutrients required by crops to achieve the optimum yield of the best possible quality. 2. Interactions between nutrients – their importance in crop nutrition. This booklet presents evidence from field experiments in the UK which shows that the plant-available potassium (exchangeable K) status of a soil has a considerable influence on the uptake of nitrogen (N) by crops. Yield response to applied fertiliser N is decreased when the exchangeable K content of a soil is below a critical target level. This response by a crop to one nutrient being dependent on an adequate supply of another nutrient is known as an interaction between the two nutrients. Where such interactions occur there is no point in saving on one fertiliser input if this affects an important aspect of crop growth which limits the effect of another fertiliser input. And if N is used inefficiently not only is this a financial cost to the grower but there is also the risk that any excess unused fertiliser N lost from the soil can have undesired adverse effects on the environment. The interactions between N and K on crop growth and yield that are seen at the agronomic level can be explained by their effects and interactions on the growth processes within the plant at the tissue and individual cell levels. Knowing how these interactions within the plant control its growth makes it easier to understand why it is important to have sufficient exchangeable K in the soil. Maintaining an adequate level of soil potassium over the long term is important because on potassium deficient soils it is difficult to distribute fresh potash fertiliser sufficiently evenly throughout the rooting zone in the season it is applied for the roots to access enough potassium to produce optimum yields. 3. The importance of potash for crops. Potash (potassium, K) is an essential nutrient for all crops. It has major effects on yield and quality as well as on the general health and vigour of a crop. Potassium is very important in the relationship between water and crop growth because it helps regulate the amount of water within the crop. Plants ‘fully charged’ with water remain turgid and upright when the individual plant cells contain sufficient solutes to maintain osmotic concentrations within the cell sap. The solute most plants tend to use is potassium, which explains why it is vital for maintaining the turgidity (rigidity) of plant cells and tissues. When there is insufficient potassium for this purpose, leaf expansion and stem elongation become too slow during the early stages of growth for the leaf canopy to expand and rapidly cover the ground. This results in inefficient interception of sunlight and photosynthetic production of assimilates required for the crop to grow rapidly and achieve maximum yield. Also, potassium has a further role within the plant that is vital for achieving optimum yields. It is required for the transport of sugars from the leaf, where they are produced, to the growing regions of the plant and to storage organs such as grain in cereals and the tubers of potatoes where they are converted to starch, or to the storage roots of sugar beet where they are stored as sugar. Crops grown on soils with too little plant-available potash become deficient in potassium and consequently produce less than optimum yields. Without sufficient potassium, crops fail to use water efficiently and consequently become more seriously affected by water stress in periods of drought. Plants also use N less efficiently and are less able to handle stress caused by frost, heat, water-logging and wind. Hence, it is essential to bring soils to the target Index for plant-available potassium (exchangeable K) and then maintain this level by replacing the amount of potash removed each year in the harvested crops. To ensure that this approach is maintaining the target Index, soils should be sampled and analysed for exchangeable K every 4/5 years. 4. Crop response to nitrogen at two levels of exchangeable potassium in soil. The interaction between N and K is well illustrated by an example from the Hoosfield Barley experiment started in 1852 at Rothamsted. Over the years, large differences in soil exchangeable K have developed between plots to which fertiliser K was or was not given. When four amounts of N were tested on both high and low K soils there was a considerable difference in the response of spring barley to the applied N (Figure 1). The small yields may partly be explained by the fact that barley was grown every year but, even so, the principle of N x K interactions is clearly demonstrated. The average yields between 2000 and 2005 show that there was no justification for applying more than 50 kg N/ha to the barley grown on the soil with only 55 mg/kg exchangeable K, but yield was further increased by an application of N of up to 96 kg/ha when the soils contained adequate amounts of exchangeable soil K.
Figure 1: Response of spring barley to N fertiliser on soils with different levels of exchangeable soil K (Kex), Hoosfield, Rothamsted. The yields of spring barley this experiment, although smaller than the current average, were about normal for the UK at the time. Unlike the potatoes, however, the response by barley to applied fertiliser N was the same at both levels of soil exchangeable K. There was no significant difference between the N response at either level of exchangeable soil K, indicating that the lower soil K level was sufficient in this trial. This result might be taken as implying that there was no need to have the extra exchangeable K when there was no increase in the yield of barley. However, it must be remembered that the barley was grown in rotation with potatoes and, as shown in Figure 2A, the potatoes gave the largest yield with most applied N when grown on soil with more exchangeable K. Maintaining the K status of the soil to get optimum yields of all crops grown in a rotation is important.In another experiment at Rothamsted in the late 1960s early 1970s, potatoes and spring barley were grown with four rates of N on soils containing two levels of exchangeable K but adequate phosphorus. Potato yields were larger on the soil that contained more exchangeable K, especially with the largest amount of N applied (Figure 2A). Thus, with ample soil K it was justifiable to apply 216 kg N/ha to get a larger yield and, at the same time recover more of the applied N leaving less nitrate in the soil at risk of being lost to the environment in the autumn. Figure 2. Response of potatoes and spring barley to applied N fertiliser at two levels of exchangeable soil K, Barnfield, Rothamsted. An N × K interaction was also shown in an experiment on grass at Rothamsted in 1965-68. Nitrogen was tested at 40 and 80 kg N/ha applied for each cut of grass, usually four harvests per year. Grass yields were greatly increased by adequate exchangeable soil K (Table 1).This experiment was on the site of one of the long-term Rothamsted experiments where the plots only had two levels of exchangeable K. Consequently, it is not possible to know whether a lower level of exchangeable K than 485 mg/kg would have been equally effective in increasing the yield of potatoes. However, it is possible to make another important comment. The soil on which the Barnfield experiment is sited is one of the most difficult to cultivate on the Rothamsted farm. There were plots that had received farmyard manure (FYM) for many years so that the soil on these plots contained more organic matter than those that only received fertilisers. The extra organic matter improved the structure of the soil sufficiently to increase the yields of potatoes by almost 8 t/ha where 216 kg N/ha was given and where there was adequate plant available K in the soil. As noted in the Introduction, the ‘rootability’ of the soil is crucially important for crops to explore the soil to take up the nutrients they require. With a better soil structure it is possible that less than 485 mg/kg Kex would have been sufficient to give an optimum yield of potatoes. Table 1: Interaction between nitrogen and potassium on the yield of grass. (Park Grass experiment, Rothamsted 1965-1968). Another N × K interaction was shown by Rothamsted experiments on winter wheat on a sandy clay loam soil at Saxmundham in 1983 and 1984. There were plots with two levels of exchangeable K, but the same amount of plant-available phosphate, and four rates of N fertiliser were tested (40 kg N/ha at sowing followed by 120, 160, 200 and 240 kg N/ha in spring). The increase in the average grain yield for the two years with increasing amounts of applied N was not large but, was larger for each rate of applied N on the soils with more exchangeable K. The grain N contents were also larger. More importantly, only 160 kg N/ha was required to obtain maximum yield on the soil with more exchangeable K compared to 240 kg/ha on the soil with less exchangeable K (Table 2). Table 2: Effect of soil potassium and applied nitrogen on the yield and nitrogen content of winter wheat grain grown on a silty clay loam at Saxmundham, 1983 and 1984.. Similar effects in farm practice could offer the opportunity for considerable savings in the cost of N fertiliser. The larger grain protein contents show that crops grown on soils with more exchangeable K took up more of the applied N. As the applied N increased from 120 to 200 kg/ha, the increase in yield ranged from 12-20% and the increase in N content from 15-24% due to the soil containing more exchangeable K.
5. Crop response to nitrogen on soils with a range of exchangeable potassium levels. The examples of N x K interactions shown in the previous section were all on soils with only two levels of exchangeable K. Thus there is no opportunity to identify a critical level of exchangeable K to achieve optimum yield. However, in 1992 Rothamsted started a large-plot field experiment on the silty clay loam soil in which a wide range of exchangeable K levels was established over several years. A similar smaller experiment was maintained on a sandy loam soil at Woburn. These experiments give Rothamsted two unique series of K-reference plots with soil exchangeable K concentrations ranging from 40 to 550 mg/kg (i.e. from K Index 0 to 4), and each experiment is on one soil type and under the same management. These plots allowed experiments to be done to relate yield to exchangeable soil K on sugar beet (funded by the British Beet Research Organisation) and winter wheat (funded by Kemira GrowHow as it was then). In the wheat experiment, the high-yielding cultivar Xi-19 was grown but only one amount of N (350 kg/ha) was tested. However, the N was applied in two different ways. It was either divided between two large dressings early in the growing season (the ‘standard approach’) or divided into several smaller dressings applied over a longer period of the growing season (the ‘canopy-managed’ approach). Table 3 shows the average yields of wheat grown on K Index 0, 1 and 2- soils. Grain yields on K Index 2- soils were just about 11 t/ha irrespective of how the N was applied. Yields on Index 1 soils were only slightly smaller than on Index 2- soils, but the way in which the N was applied began to affect yield, which was smaller where N was applied in only two applications (the ‘standard approach’) rather than as several (the ‘canopy-managed’ approach). This effect was even more pronounced on K Index 0 soils. On the K Index 0 and 1 soils insufficient available soil K taken was up by the crops to allow them to make maximum use of the applied N when it was divided between two large divided dressings rather than given more frequently ‘to meet demand’. Where fresh K was not applied and N was applied using a ‘canopy-managed’ approach, yield was about 1.0 t/ha smaller at the lowest level of exchangeable K compared to 4.2 t/ha less using the ‘standard’ approach. Where fresh K was applied, yield was only slightly less on K Index 1 soil but was about 1.0 t/ha less on Index 0 soil. Because yields from the low K plots were smaller with the ‘standard approach’ of N application, less of the applied N was recovered in the harvested grain. More of the N was therefore lost from the system and this nitrogen represents an unnecessary expense to the grower as well as an environmental cost. The effect applying 100 kg of fresh K2O/ha as a spring dressing to the wheat failed to raise the yields on K Index 0 soils to those of K Index 2- soils. Yields of crops grown on a sub-target K Index soil will rarely equal those of crops grown on soils that are at the target Index. Furthermore, applying fresh K to a low-K soil to increase yields in the current growing season to raise yields to the levels obtainable with adequate reserves of soil K is rarely likely to be successful. This is because, as noted earlier, it is impossible to thoroughly mix 100 kg K2O/ha (the amount tested here) into the 2,000,000 kg of soil in the top 15 cm of a hectare of land, especially when roots, at best, only explore about 25% of the topsoil in any one year. Under these circumstances, there is little chance of roots finding enough of the freshly-added K to greatly increase yield. Table 3: Effect of declining levels of exchangeable K in soil on winter wheat grain yield and the effect of freshly applied potash. The experiments on sugar beet tested N at 90 and 150 kg/ha with and without 100 kg K2O/ha (Table 4). When no fresh K was applied, average maximum sugar yields (10.3 t/ha) were obtained on the K Index 2- soil with 150 kg N/ha. Decreasing the amount of applied N to 90 kg/ha decreased sugar yield by 0.5 t/ha. Yields were smaller when the sugar beet was grown on K Index 1 and 0 soils being 0.4 and 1.6 t/ha less, respectively, for crops given 90 kg N/ha, and somewhat larger losses, 0.7 and 2.5 t/ha, respectively, on K Index 1 and 0 soils when given 150 kg N/ha. Applying fresh K to the K Index 0 and 1 plots did not increase the yields of either the 90 or 150 kg N/ha crops to the levels obtained on the K Index 2- plots. This, again, shows the importance of maintaining soils at the target K Index for all the crops in rotation rather than hoping that applying fresh K to a 11 low-K soil in any single year will give yields equal to those achieved on soils maintained over the longer-term at the target K Index. Table 4: Effect of declining levels of exchangeable K in soil on sugar yield from beet and the effect of freshly applied potash at two rates of N.
6. Crop processes underlying nitrogen and potassium interactions. The primary processes involved in growth and dry matter production, such as photosynthesis and protein synthesis, upon which final yield depends, occur within individual cells and tissues. Although individual cells are extremely complex and often highly specialised to perform different functions, they can be visualised simply as a expandable cell wall enclosing a central space, the vacuole, containing an aqueous solution (Figure 3). Because it is largely composed of water, the vacuole has an important role in the water economy of the plant and it acts as a ‘general storage compartment’ for nutrient ions, like potassium, phosphate and magnesium, and other solutes like sugars. The vacuole of a mature cell comprises more than 80-90% of the total cell volume and contains most of the plant’s water. The volume of water contained within cells increases considerably as cells expand (for example, a two-fold increase in cell length, approximately results in an eight-fold increase in cell volume and quantity of vacuolar water). This has implications for the K requirement of the plant because the forces (or turgor pressures) required to power cell expansion are ultimately generated by the concentrations of osmotic solutes within the vacuole, and potassium is the major osmotic solute. One major determinant of growth and a prerequisite for large yields in most arable crops is the rapid expansion of the leaf canopy in spring which allows it to fully capture the sunlight energy required to convert carbon dioxide (CO2) first to sugars (soluble carbohydrates, e.g. C6H12O6) and then into dry matter. Nitrogen is a major driver of leaf canopy expansion, which it does by increasing cell division and cell expansion (Figure 4). This large, nitrogen-induced increase in cell number and volume, and the consequent changes in cell water, requires a corresponding increase in the uptake of potassium to maintain the osmotic concentrations of leaf tissues (which otherwise will become diluted) at an effective level to maintain turgor. Much of the total N and K required by crops is therefore taken up to sustain development and expansion of the leaf canopy during the early months of growth. Figure 3. Simplified representation of a plant mesophyll cell, showing the vacuole, from Mengel and Kirkby ‘Principles of Plant Nutrition’, IPI, 1987. When used wisely, N is probably the major agronomic stimulant to crop growth within the farmer’s armoury. But for N to play its full role in increasing yield, a crop must also have access to, and take up, an adequate amount of plant-available K. Where this supply is adequate, the amount taken up depends very much on the input of N, as found for spring barley grown on Hoosfield at Rothamsted. Increasing the N supply doubled the N content of the shoot and this was accompanied by an increase in K uptake until anthesis. Figure 4. Effects of low ( ), normal ( ) and high ( ) soil N fertility on the size of individual sugar beet leaves and the number of cells and mean cell size of the 15th leaf. Applying N to meet increasing demand by a rapidly growing crop invariably results in a very obvious visual response, which is invariably associated with an increase in yield. This association between N supply and yield is observed so frequently and the increase in dry matter is expected as a matter of course. What is less obvious and rarely realised, however, is that the increased supply of N also greatly increases the amount of water in the crop. In cereals, for example, there can be between 10-15 t/ha more water in the shoots of a crop well supplied with N than where N is limited (see Figure 5). Figure 5. Patterns of dry matter accumulation and tissue water content of shoots of spring barley grown on Hoosfield with 48 ( ) and 144 ( ) kg N fertiliser/ha (Figures a, b) and sugar beet grown at Broom’s Barn with 0 ( ) and 120 ( ) kg N fertiliser/ha (Figures c, d). These differences in the water content are even greater in sugar beet in which crops well supplied with N can contain 30-35 t/ha more water than those with less N. We have already explained how these increases in water content come about through the stimulation of cell division and cell expansion and lead to an increased demand for larger amounts of osmotic solutes such as potassium to maintain turgor. Thus applying more N to increase yield requires more plant-available K in the soil and without this K, the response to N will be limited. The interactions between N and K at the cellular level therefore help explain their interactions at the agronomic level. When used wisely, nitrogen (N) is probably the major agronomic stimulant to crop growth within the farmer’s armoury. But for N to be used efficiently in crop production and play its full role in increasing yield, a crop must also have access to, and take up, an adequate amount of potassium from the plant-available (exchangeable K) pool of K in the soil. This is because there is a strong interaction between these two nutrients in crop growth which decreases the crop’s response to applied fertiliser N when the exchangeable K content of a soil is below a critical target level. Because of this interaction, there is little point in applying large amounts of N when there is too little exchangeable K in the soil because the N is used inefficiently and represents a financial cost to the grower. There is also the risk that any excess unused fertiliser N lost from the soil will have undesired adverse effects on the environment. The interactions between N and K on crop growth and final yield that are seen at the agronomic level can be explained by their effects and interactions on the growth processes within the plant at the tissue and individual cell levels. Knowing how growth is controlled by these interactions within the plant makes it easier to understand why it is important to have sufficient exchangeable K in the soil. Maintaining an adequate level of soil potassium over the long term is important because, on potassium deficient soils, it is difficult to distribute fresh potash fertiliser sufficiently evenly throughout the rooting zone in the season it is applied, and for the roots to access it so that the crop can respond to all of the applied N fertiliser and produce optimal yields. The primary processes involved in growth and dry matter production, such as photosynthesis and protein synthesis, upon which final yield depends, occur within individual cells and tissues. Individual cells can be visualised simply as an expandable cell wall enclosing a central space, the vacuole. The vacuole of a mature cell comprises more than 80-90% of the total cell volume and contains an aqueous solution. Maintaining the water content of the vacuole requires a sufficient concentration of salts in the water to sustain the osmotic concentration, and potassium is the salt most plants seem to prefer to do this. The volume of water contained within a cell increases considerably as it expands (for example, a two-fold increase in cell length, approximately results in an eight-fold increase in cell volume and in vacuolar water). This has implications for the K requirement of the plant because the forces (or turgor pressures) required to power cell expansion are ultimately generated by the concentrations of osmotic solutes, principally potassium. One major determinant of growth and prerequisite for large yields in most arable crops is the rapid expansion of the leaf canopy in spring which allows it to fully capture the sunlight energy required to convert carbon dioxide first to sugars and then to dry matter. Nitrogen is a major driver of leaf canopy expansion, which it does by increasing cell division and cell expansion. This large, nitrogen-induced, increase in cell number and volume, and the consequent changes in cell water, requires a corresponding increase in the uptake of potassium to maintain the osmotic concentrations of leaf tissues at an effective level to maintain turgor. Much of the total N and K required by crops is therefore taken up to sustain development and expansion of the leaf canopy during the early months of growth. Applying N to meet increasing demand by a rapidly growing crop invariably results in a very obvious visual response, which is usually associated with an increase in yield. This frequently observed association between N supply and yield is expected almost as a matter of course. What is less obvious and rarely realised, however, is that the increased supply of N also greatly increases the amount of water in the crop. For example, the shoots of a cereal crop well supplied with N can contain between 10-15 t/ha more water than those of a crop where N is limited. The difference in water content between sugar beet crops well- and poorly-supplied with N is even greater. A crop well supplied with N can contain 30-35 t/ha more water than one given less N. The increased water content in crops well supplied with N is the direct result of the stimulation of cell division and cell expansion. The increased water content leads to an increased demand for larger amounts of osmotic solutes, principally as potassium, to maintain turgor. Thus applying more N to increase yield requires more plant-available K in the soil and without this K, the response to N will be limited. The interactions between N and K at the cellular level therefore help explain their interactions at the agronomic level.